Eucarpia 2013 » HOW TO GET HERE? 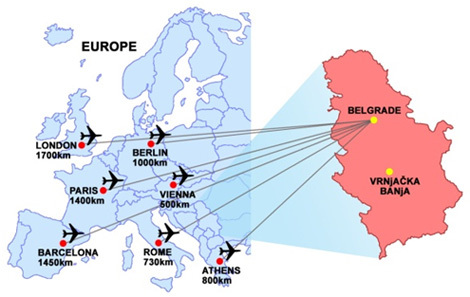 Serbia is easily accessible from the most major European cities by plane, train, bus or car. Several departures will be arranged depending on interest and planes arrival schedule in Saturday and Sunday, or in Thursday and Friday for return to Belgrade. During registration please indicate interest for this way of transport and supply Organizing committee with detailed information about your plane arrival time and departure time through following form. There are 21 departures from 6am to 8pm provided by different carriers. There are 21 departures from 4am to 6:15pm provided by different carriers. Taxi transport in Vrnjačka Banja is affordable (for all city rides around 3-4EUR) although distances are very short and excellent for walk.